Well, I have been away for a few days but not without good reason. Firstly though I want to thank you all for the encouraging comments re; the new hospital appointments for potential health issues. Tamoxifen is renowned for messing with lady bits and bobs so yes, I have dodgy symptoms BUT for many they are a normal side effect of the tablets. The Drs are eering on the side of caution and I really am fine with it. As a friend of mine told me, once you are under the medical microscope they don't want to let you go and a plus side is that if things go wrong, I would find out much quicker than someone who hasn't already had a C diagnosis. So I will obviously keep you up to date but apart from the odd wobbly moment (normal for me lol), I really am good to go. And thank you. Your support means my wobbly moments are getting less and less with each month. Now, why have I been away? I have finished the first charity rag quilt. Each block was ten inches and the photo doesn't do it's pinky goodness credit but you can get the idea! I chose a rag quilt because once you have had a breast cancer diagnosis you left a little rough and frayed at the edges but still as beautiful as you were before it. I wanted the emphasis to be on the pink rather than the fact it is pink ribbon fabric so I thought a little flower with some lime green will bring it together. Looking at it now I wish I had made the leaves bigger but when I put it like that on my quilting board (haha..aka the floor) it didn't balance. I will try to get a better photo tomorrow. It really is very pretty. The fabric was donated by Carolyn and Maggee. Wasn't that kind? I still have some of Maggee's to use but that will start tomorrow. I am not a natural quilter: I struggle and stress because points don't meet or my back hurts cutting fabric but I really, really, totally love rag quilts! I will def. make more of them! So. How am I going to raise funds for cancer charities with this pretty quilt? Good blooming question. I have had an idea but I would really like to hear some feedback first as it has become somewhat a conundrum! Please read carefully: It may sound a bit complicated so I am going to try to be really clear...as mud you might say! First: I would like to ask if some of you would like to donate something for a draw, as well as the things I am making or is that too cheeky? . Second: I will open two, possibly three 'just give' pages which are linked to various breast cancer charities. I will chose the Irish Cancer Society, a UK breast cancer charity and possible one in the USA. The charities will be chosen according to their research schedules. I know the Irish Cancer Charity works with specialists here in Ireland who link in with Specialists in the USA (Washington in particular) and the UK and this research benefits everyone as they work together to find treatments and cures. The other charities will be chosen for the same thing and this will give you the option of chosing a charity from your own country or support their research. At the end of the day we all benefit! The Just Give sites do take a small percentage but it means donations are transparent: you can see who is donating what (you can chose to hide your name) and they give the money straight to the charities. They are secure so your bank details are safe and I can't be accused of anything. I raised over 2000 euros for the Irish Cancer Society but a lot of the donations were through workshops I did and paypal: I have letters from the charity thanking me but it would mean scanning and printing them and putting them up here and it just makes it messy. I wasn't sure if adding these values to the Just Give site would mean they would also take some of that as a commission even though the money didn't go through them so I didn't dare put it up. And well, you see how it goes. Transparency and clarity all the way! Thirdly: We will make everyone aware of this draw and ask people to donate. For every single unit donated through my Just Give sites, you will be given one tag with your name etc on it and it will go in a big tub ready for someone to chose by either dipping their hand and they will be alloted a prize. We are all suffering with the recession and this option means people can chose to give eg 1 euro, 1 pound, 1 dollar which at the end of the day will all add up. So if you donate five euros that means five seperate names in the draw: five chances to win. Fourthly: People who donate can specify if they are prepared to pay postage and if so where: people who make a donation can let me know if they would be willing to donate to the person offering the prize postage and I will organise draws accordingly. Eg if someone in the USA will offer to post a prize to someone in the USA free I will have a USA draw only. I hope this makes sense and as you can see I really would like your feedback. To simplify it, donate a prize, it will be shown on the prize page of my blog, people can donate to my direct 'just give page' charities and for each unit donated, they receive id tags which are put into a draw for the prizes which are sent directly by their donators. Have a think and see what you reckon to it. Thank you for taking time to work this out for me. 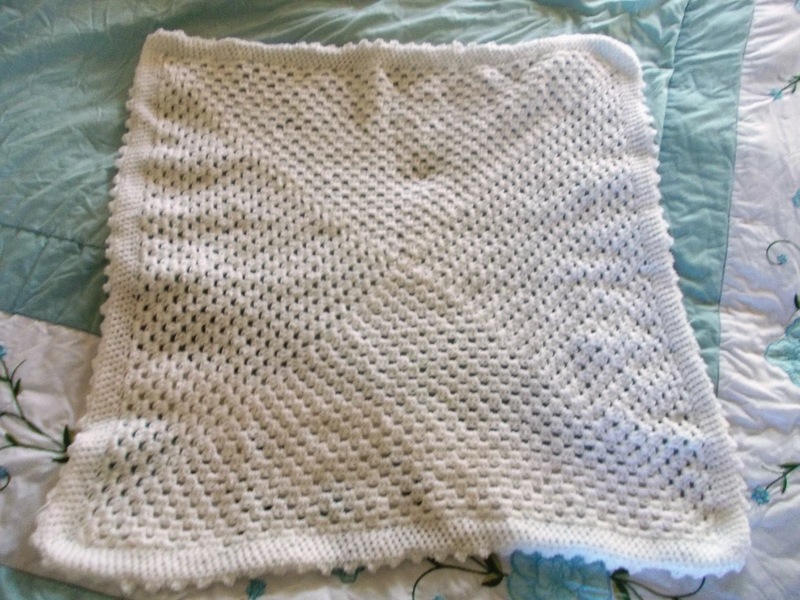 On a very different note, I have finished my very first crochet baby blanket! Yet another craft I am now completely addicted too! I need more hours in the day!!! And I nearly have a cross stitch finish! I will hopefully be able to show it later in the week! Right, well, that made the brain hurt lol. Have a lovely week everyone and please, please, any ideas or feedback re the potential fundraiser are very, very welcome! Happy stitching to you, I hope you make many more lovely quilts! Fabulous quilt, lovely fabrics you chose. 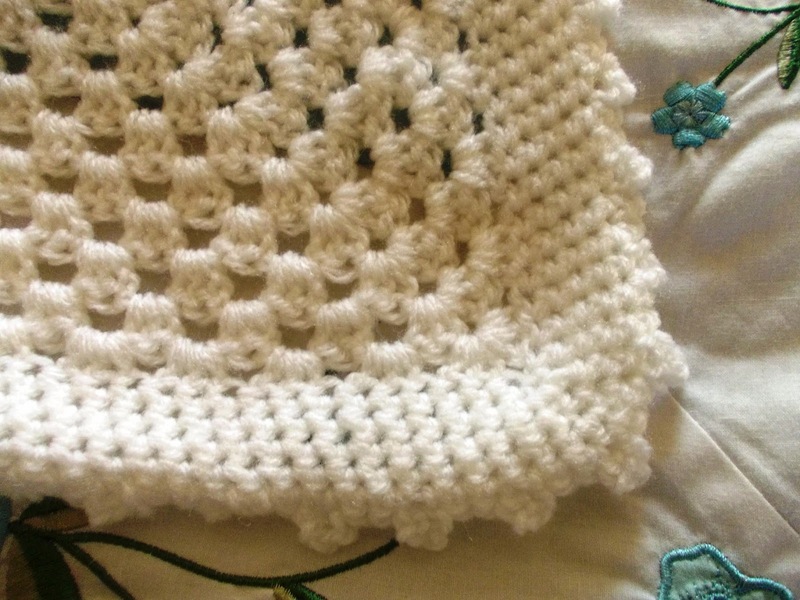 Love the crochet baby blanket, some little person is going to be all snuggly in that. I can knit you a pink Mrs Bunny for your prize if you think ladies would like one? The quilt looks great and the baby blanket looks perfect, So sweet. I am sending you wishes for good health and for success in your fund raising efforts!